With Infrascale Disaster Recovery Service, There’s No Trade-Off. For meeting the fastest-possible RTO (Recovery Time Objective) while making a safe and pragmatic disaster recovery investment, with Infrascale Disaster Recovery Service you can have your cake and eat it too. Infrascale Disaster Recovery Service solutions address IT requirements for backup, and disaster recovery. It has multiple enterprise grade components like automated recovery plans, built-in testing, virtualization, on-premises appliances, elastic cloud storage, global cloud data centers, all configurable to suit every customer’s specific needs. Infrascale Disaster Recovery as a Service is designed for organisations of all sizes. It provides an all-in-one solution for disaster recovery, backup and data storage to companies who demand extremely low tolerance for data loss, downtime or sub-par risk mitigation. It looks simple on the surface: backup, replicate, recover… But the devil, as they say, is in the details. This paper will guide you through the options you have, and ultimately will help you plan your disaster recovery solution. Protects all of your data on both physical and virtual infrastructure, VMware or Hyper-V and Windows, Linux, Unix OS. Orchestration workflow editor to specify the order in which machines are recovered, specify groups of machines to boot simultaneously and specify time intervals between system boots, ensuring smooth system recovery. Push-button recovery of entire data centers with automated runbooks designed in an intuitive, graphical recovery plans editor. No more hand-written recovery plans! 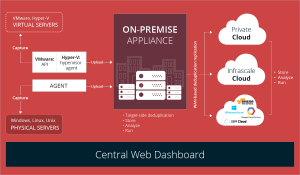 Support for Hybrid (local appliance and cloud) and cloud only in a unified DRAAS solution. Industry leading 15 minute SLA for failover with an average recovery time of 70 seconds per server. Rebuilds your network automatically using software defined networking, capturing a complete copy of your on premise datacentre in the cloud. Say goodbye to formal DR declarations. Now you can test whenever and as often as you want to with push button simplicity.